Peel and halve potatoes. Transfer to cooking container and steam at 100°C/210°F for approx. 20 min. Mix olive oil, some of the mustard, salt, and pepper in a large bowl. Cut pork tenderloin into equal-sized pieces and add to bowl. Toss to coat. Transfer to cooking container and steam at 100°C/210°F for approx. 15 min. Add meat stock, cream, and remaining mustard to a small saucepan set over medium heat. Mix starch with some water, add to saucepan and bring to boil. Season with salt and pepper and keep warm on low heat until remaining ingredients are ready to be served. Transfer peas to cooking container and steam at 100°C/210°F for approx. 2 min. 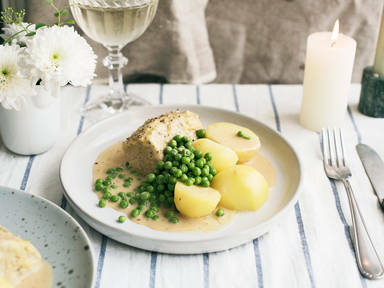 Serve pork tenderloin, potatoes, and peas with sauce. Enjoy!